The Florida Keys - a wonderful place for relaxation. The fish is fresher here, the water clearer, and the nightlife more vibrant. That is why many Florida residents vacation here as well. Let us take you on a guided tour !! Let's start our tour in the North and work our way South to Key West ! Key Largo is one of the busiest diving locations in the world. As you enter the Keys by car from the North, you immediately find dozens of dive shops. If you prefer smaller dive parties, you may also consider staying at a dive resort. These usually have their own boats and only take divers who are staying at the resort. 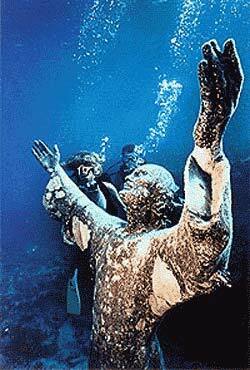 A popular dive destination in the Key Largo area is the Christ of the Deep, pictured above. Apart from the statue, which is in very shallow water....there really isn't much more to see at that dive site. Most people come to Key Largo to dive at the world-renowned Pennekamp (full name: John Pennekamp Coral Reef State Park). The water is very clear and the wildlife abundant. You won't be disappointed. There are many, many dive sites in the Key Largo area. Overall, there is excellent reef and wreck diving, and snorkeling in the area. See our underwater slide show for more pictures. For more information about what there is to see and do in Key Largo, please visit the About Key Largo section of our site.